Some dudes just sound like they were born to do it, and listening to the classic heavy rock groove of The Socks, there can be no doubt it’s what they’re made for. They’re naturals. The double-guitar French foursome formed in Lyon in 2009 and started surprising audiences almost immediately, eventually settling down to pump out their debut EP the following year. 2010’s Side A was five songs well concentrated from a band still feeling out where they wanted to go. You had your Sabbath, your Zeppelin, and The Socks supported the release by playing with an array of national and international acts, busting out energetic, intense gigs while continuing to develop their style. The next two years drove the band to write darker songs, hit harder, become thicker, more powerful, more calculating and less frenetic. The resulting 2012 EP, Bedrock, soon caught Small Stone Records’ eye, with strong instrumental performances from Jess (drums), Vincent (bass), Nico (guitar/keys/vocals) and Julien (vocals/guitar), the latter also serving as the frontman and delivering a guttural but memorable vocal performance throughout the tracks, psychedelic in some places and elsewhere delving into a neo-grunge moodiness that was a change from the first release. 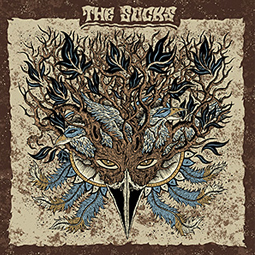 During Fall 2012, The Socks completed their first European tour, drawing on experience garnered from festivals and gigs alongside Karma to Burn, Red Fang, Truckfighters, Horisont, Mars Red Sky, Black Rainbows and many others with whom they share some elements while still maintaining a personality of their own. Simply put, they were a hit. Small Stone picked up the band and is set to issue their first full-length in 2014, as the band continue to thrust themselves into Europe’s next generation of heavy rock and roll alongside acts like Abrahma, Deville, Asteroid, Isaak, Black Rainbows and Mother of God. Look for The Socks to continue their momentum into 2013 and beyond, in the studio and on the road, and expect nothing less than some of the finest riffs the continent has to offer. That’s how it goes when you deal with naturals. Recorded & mixed by Raphaël Cartellier at Studio Cartellier, France. Mastered by Christopher Goosman at Baseline Studio – Ann Arbor, MI. Artwork & layout by Arrache-toi un oeil. All songs written by The Socks.